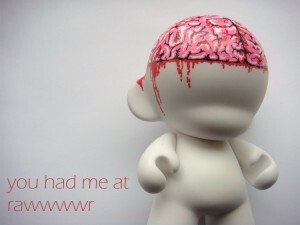 My zombie love story “You Had me at Rawwwr” is up at Drabblecast. This one’s a favorite of mine, and I’m glad to see it get a little TLC. And you sold a story to Kaleidotrope? Congrats! 🙂 Thanks! I’m hoping for a record number of sales this year. I’ve got the rest of the year to make 5 more. I’m glad you liked the story! There’s no text version online yet, unfortunately. Blogger Zombie Walk sounds like a lot of fun. I’ll be sure check out your site and some of the others. One last question. Are you on Twitter, or do you have a Facebook fan page I can point people to?